The man behind Les Mis says fans who fell in love with the smash musical during its multiple runs in Toronto can look forward to a "completely new version" this fall. The man behind Les Misérables says Toronto fans who fell in love with the smash musical during its multiple runs in the city can look forward to a "completely new version" this fall. The epic 19th-century tale headlines a slate of 14 shows Mirvish Productions announced Wednesday for its 2013-14 season. 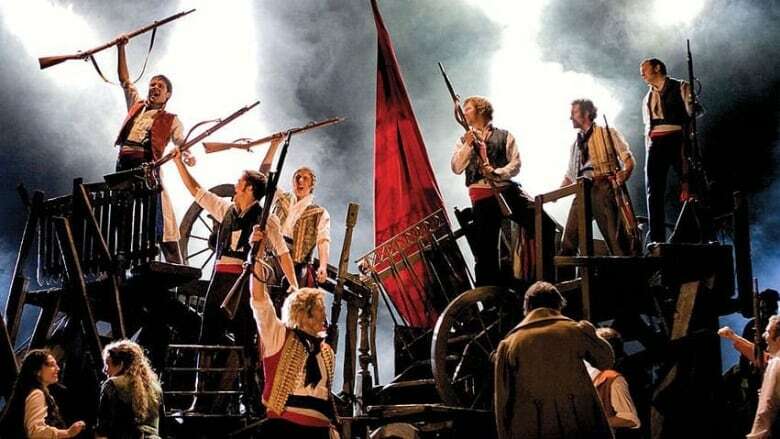 "What we're not bringing is the old version, we're bringing the new version ... for the 25th anniversary," producer Cameron Mackintosh said of Les Misérables, due to open at the Princess of Wales theatre in October. "It's completely new sets, they're based on the paintings by Victor Hugo — we discovered that he'd painted over 400 amazing impressionistic paintings, so the set has come to life out of his work, as well as his words.... It's got completely new orchestrations." He added: "It is a completely new show with a different point of view, and why shouldn't it be? It's nearly 30 years since we did the original one. New generations want to get at the material and put their stamp on it." The 25th anniversary version of the Boublil & Schonberg production has already been playing in various locations for 2 1/2 years, and Mackintosh dubs it a "phenomenal success." The Toronto version will star Canadian actor Ramin Karimloo as convict Jean Valjean. Mackintosh says the latest show has been embraced by Les Mis diehards and will introduce the musical to a new generation of fans. The current success of the big-screen version — starring Hugh Jackman and Anne Hathaway — doesn't hurt the new show either, he acknowledged. "The movie, thank God, has been wonderfully received and is a huge success," Mackintosh said of the film, which is nominated for eight Academy Awards. He added: "What I'm most relieved about is fans of the show have embraced the movie as a thing in itself." the return of Disney's The Lion King (due to run from April 21 to June 18, 2014). Upcoming plays, meanwhile, include The Last Confession, a look at the sudden 1978 death of Pope John Paul I. Star David Suchet, well-known in England for his TV role in the long-running Agatha Christie's Poirot, believes Pope Benedict's sudden resignation this week will spark interest in the production. "I think it will," he said. "[The play is] all to do with what happens in the Vatican, what does go on behind those closed doors." He originated the role in 2008 on London's West End but was never able to re-mount it because of Poirot, which is now wrapping. "The public really loved it because it's a nail-biting thriller, really, even though the audience knows what's happened," said Suchet of The Last Confession, set to open next January. "It was hugely successful in London." January will also see the opening of Arrabal, a dance spectacular from Canuck choreographer Sergio Trujillo and a stage version of Kafka's Metamorphosis. Andrew Lloyd Webber's beloved Cats, meanwhile, will return to Toronto in May. The centrepiece of the season for many theatre-goers, however, will no doubt be Les Mis. According to the show's website, it has now been seen by more than 60 million people in 42 countries. Many in Toronto have strong memories of seeing the beloved musical, including Karimloo himself, who grew up in Richmond Hill, Ont. "I just remember being blown away because the first thing I ever heard was the [cast recording] album and [star] Colm Wilkinson's voice was just extraordinary. I'd never heard anything like it. It's a soulful voice and that's what I love. And although he wasn't [playing] Valjean at the time ... that's what drew me to the show." Mackintosh says he's been waiting for the right moment to bring the show back to Toronto. "It was one of the first musicals to be done for a long sit-down run in Toronto, and everytime we brought it back to Toronto, it has had a great success. But it hasn't been there for many years and I wanted to wait until I had a new version before I brought it back."